A converging point for three essential London moods—shoppers' flurry on Oxford Street, the historic elegance of Marble Arch, and the swanky-iconic flavour of Park Lane—seems a fitting spot for Notch. 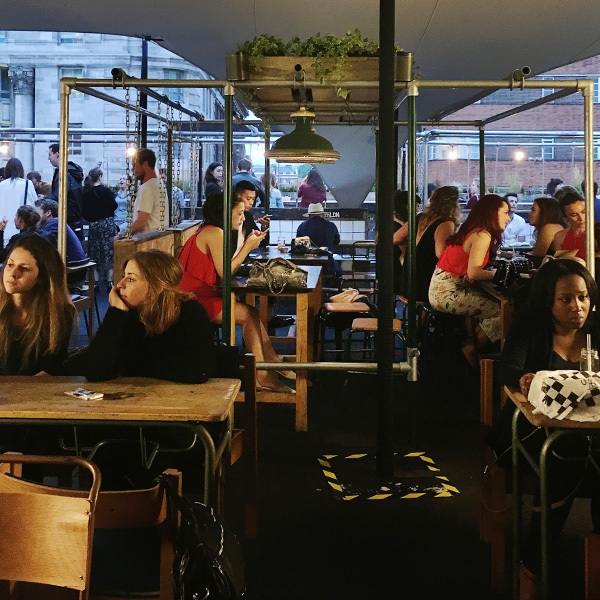 The pop-up bar makes a statement without being specialist: it's accepting, much like the city it thrives in. No sign of a signboard is confusing at first, but a bouncer standing next to a black door gives the place away (it's adjacent to the souvenir shop right opposite Marble Arch tube station). A climb up to the third floor is rewarded with a spectacular, excited space. We visited on a Saturday evening—it was 7pm and still daylight. The swing seats along the edge looked as promising as we had imagined them to be on reading about them. And although the rest seemed bland in comparison, each seat had a USP of its own—whether it was being located in a snug corner, greenery sprouting through the table, or proximity to the bar. In appropriate response to the nature of their guests, bartenders here keep it friendly, crisp and cheeky. We ordered jars of the "red pigeon": espolon tequila, campari, lime, pink grapefruit and sugar, which were handed to us by a burly man pretending to be exhausted with our demands (we wanted to pay with a card and not cash). The pretty pink cocktail tasted as good as it looked: tart and only slightly sweet; we ordered two rounds. Our swing seats kept us feeling floaty as the Oxford Street bustle below morphed into slower evening walks. Expert mixology was matched by a soft pork bun and glazed chicken wings. The pork bits seemed to melt into their cottony bun covering, the slight sweetness from the hoisin sauce balanced nicely with finely chopped scallions; black sesame seeds added a subtle new dimension to regular wings. Both turned out to be some of the best bar snacks we've encountered in the city. The food counter lets you place your order and then wait for it to arrive at the table with the help of an identifying token, unlike the bar, which expects you to pick your drink up right after you pay. With an organised yet unobtrusive style of service, the place achieves a pleasant balance between caring and casual. Everything's around if you need it, but none of it shoves itself in your face. Notch knows what it wants and targets that with ease. None of the guests seemed to be over the age of 30, at least on the evening we visited. And as is the case with most London rooftop popups, the primary clientele seems to be people who have hipster invisibly tattoeed on their arms (although the Central London variety differs slightly from the stereotypical Hackey wayfarer).